More specialist nurses for dementia, less gimmicks please. Ta. With commissioners having to make crucial decisions about acute and chronic healthcare, and, with an ever increasing budget being engulfed for some by paying PFI loan debt repayments, it has never become more important to have properly funded resources for medicine, nursing and social care. Gimmicks, such as badges and pledges, or talks given by people with worse than a very basic knowledge of dementia, can have their place, but they are never a replacement for care and support from the State which needs adequate financial funding. 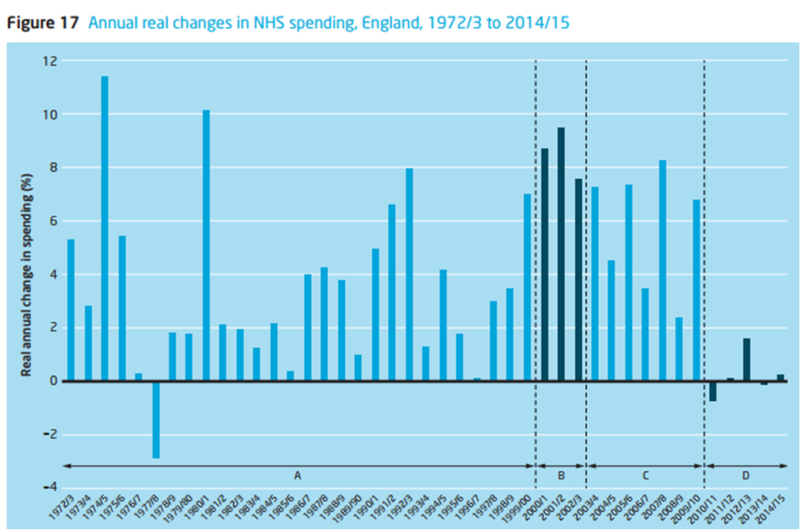 With graphs such as this displaying real time spending in the NHS as a whole, cutting back on care might seem like an easy option, especially with a supine media promoting ‘awareness’. Awareness cannot be ascertained by how many stickers you have in a shop window, or how many corporates you have to got to sell your gimmick with your logo. It’s about a dialogue about the dementias are about, what medications can and cannot do, and possible strategies for supporting living well with dementia or what makes a care home, amongst lots of other issues. There is an alternative to trivialising dementia. I am now actively avoiding twitter conversations which trivialise dementia to a gimmicky or an equally superficial level where you flit about talking crap to another. From the point of an initial diagnosis, to navigating your way through an increasingly complex health and social care and benefits system, and to experiencing the raw emotion of it all, the experience might be called a ‘journey’. This term clearly has its limitations, as there aren’t any suitcases packed, and there’s no return ticket. There are questions to be asked, invariably. Is there medication which might slow down the symptoms? Recent years, with different agendas to blame, have witnessed obfuscation and subterfuge of this basic issue. See my recent blogpost here, for example. Either way, what is the prognosis? How will the illness develop? What alternative support mechanisms are there? Can the person with dementia, at various stages, be supported to stay at home? Or would a residential home offer a better quality of life? What determines a good residential care home? Could a member of the family accept the person into their own home? What is the role of the social services – will three 10 minute visits every day go anywhere near alleviating the family’s worry? These questions are invariably important. Yet, if the GP or the Consultant who diagnoses the condition, pointed the family in the direction of Dementia UK’s Admiral Nurses, so many of the family’s questions would be answered immediately and the “journey” now being undertaken would not be so lonely. It has struck me how keen people are for ‘befriending’ schemes run by people who literally have no idea what dementia is, while criticising vehemently the ‘care model’ of Admiral nurses. This is simply not on for me. The problem is that there are far too few Admiral Nurses, and the name is not widely known – although, of course, it should be known by the medical profession. Until recently, Admiral nurses, only formed part of community nursing teams. But now the principles are being used in hospitals too. Even if there is no Admiral Nurse in your geographical location, the medics could at least suggest Admiral Nursing Direct’s telephone help line. This is staffed by experienced Admiral Nurses and offers practical advice and emotional support to people affected by dementia. Admiral Nurses are supported by Dementia UK. The charity works with NHS Trusts and other not-for-profit organisations- such as Making Space, Age UK and the Royal British Legion – to set up the services. It costs £80,000 per year for an Admiral Nurse – £50,000 for the salary (the NHS standard wage for someone who is as highly skilled as Admiral Nurses need to be) and £30,000 for the Admiral Nursing Academy costs, Pioneer work and other overheads. Dementia UK provides the £30,000 needed to train a Registered Mental health Nurse to become an expert in Dementia care and the salary is paid by the NHS or other not-for-profit organisations. One thing that the general public are not is stupid. All nurses can make a contribution across the dementia pathway, defined as the right care, support and treatment for a person with dementia in the right place and right time. This should be rrespective of provider, whether it’s within the NHS, social, private, voluntary or prison sectors. This support starts right from living well with dementia, empowering persons with real information about what to expect from the condition, and reducing social stigma, through to early identification, diagnosis, and maintaining health and wellbeing. This will need ultimately to come to a helpful and constructive candid discussion about end of life care and bereavement support for carers and their families. All nurses – public health nurses, midwives, mental health nurses, learning disability nurses, district nurses, community nurses/matrons, practice nurses, Admiral Nurses, specialist nurses including specialist dementia nurses, acute nurses, Macmillan nurses and palliative care nurses – all have their part to play in achieving, and sustaining, better outcomes for people with dementia, at all ages. If you are a carer for someone with dementia, you might think about joining Dementia UK’s “Uniting Carers”, which is an involvement network of family carers of people with dementia. The aim of the network is to give carers the opportunity to raise awareness and increase people’s understanding of dementia – and find support from others in the same situation. Click on the link on Dementia UK’s website. Finally, it’s struck many of us that many hospitals are ill-equipped for patients with dementia when they are admitted with a medical problem. People with dementia don’t go into hospital because they have dementia, they are there because they are physically unwell but, unfortunately, acute hospital staff have been ill-equipped to deal with the added needs that dementia presents, both for the person with dementia and their carers. With the introduction of ‘efficiency savings’, some acute medical departments took on the atmosphere of a conveyor belt. This is alarming also for the junior staff who have to work in such conditions, whilst simultaneously expected to deliver ‘compassion’. Of course, for many who have never done a clinical rôle in their life, such as worked in entertainment or politics, it can be low hanging fruit. Under such conditions, it can seem that meeting the physical and psychological needs of patient gets given a low priority. And simple things can make a massive difference. For example, if patients are confined to bays, they might be tempted wander off and be at risk to themselves or others. On the other hand, if you give them a table and encourage patients to join each other for a biscuit and a chat, they will relax and have a much more positive experience of being in hospital. Some nursing leaders clearly are passionate about reforming hospital care for patients with dementia and their families. Take for example development of the pioneering dementia-friendly ward for patients with memory problems who are admitted with a medical condition, which includes brightly coloured doors to help patients remember which bays they are staying in and a lowered nurses’ station renamed “reception” to improve accessibility and ensure patients feel more comfortable. So let’s give the gimmicks a bit of a rest, and invest in proper care and support for once? AND FINALLY, here’s a petition to recruit more Admiral Nurses. Yes, despite the “Prime Minister’s Dementia Challenge”, it really has come to this. I didn’t realise how few Admiral Nurses there are in the UK Shibley. My sister-in-law’s family and their life was transformed by an Admiral Nurse in Maidstone, Kent. How incredibly lucky for them.